However, this could be easily controlled and managed in WordPress to stop all your desire posts from indexing by telling to search engine bots not to crawl selected pages. So, what will you do, If you are using blogspot platform and needs to stop specific posts from robots crawling. 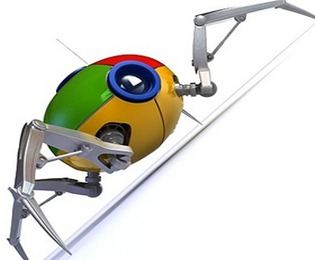 Does blogspot provide any option to check a single or multiple posts not crawled by Robot. So if you are keen to know how to stop search engine from indexing your specific post in blogger then you've come to the right place. Like in WP we could also control in blogspot blog to stop crawling for certain posts. After the introducing of new blogspot interface a lot of changes occurred and it has been included a large collection of additional options with prominent features. One of the finest option included we called it dynamic meta description. So if you did not setup to enable the dynamic meta description in the dashboard . Then there would be a piece of bed news for you, that you won't be able to stop any post from indexing. Go to Blogger dashboard >> Click on your blog >> After this click on posts >> Now click on edit button on the post which you want to make de-indexed. When the post open properly, click on the Custom Robots Tags >> Now you will be given certain options >> Un-check the default option. and then check the noindex box from the following option. >> Click on done button you all most did it. Look in the below screenshots to give you the perfect illustrative view. Step 2: Click on the Custom Robots tags and then you will see the following options. like in below screenshot. 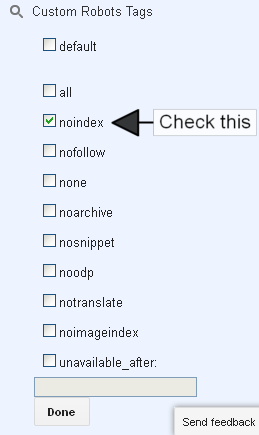 Step 3: Now first un-check all the option except noindex as shown in the below screenshot. Final Step: Now click on done button you did it almost. Making this customization after that this post will not show in the search engine result and will be blocked from indexing. 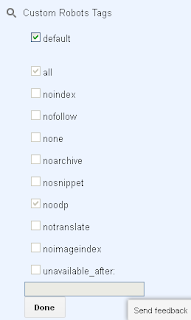 Remember: You won't be able to find the above options, yet if you did not enable the dynamic meta description. So first enable the dynamic meta description with the help of below given tutorial. Read: Enable dynamic meta description for each post in blogger. We hope this little tutorial helped you in learning how to stop search engine from indexing the specific page or post in blogger. 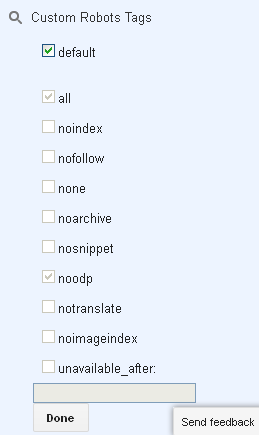 So, if you have dozens of unoptimized seo posts then you could easily controlled all of them by making them noindex. If anyone face problem then kindly do share your query in the below comment section. We will soon reply when time allows. Thanks. Great to see you buddy here. yes bro..if you want to stop certain posts from indexing then you can easy do such customization in blogger by follow the above trick.thanks. Thanks Adil bro...we are happy to see you here all the time...stay tuned we will bring more tutorial in future..
Sure buddy...You did also alot in blogo-sphere...thank for your kindly feedback. index options individually. But robots.txt is probably the way to go. I was using blogger for blogging a year back but now i have moved to wordpress, this is the interesting things which not only i learned but the other probloggertricks followers learnt from this post. thanks hafeez for sharing this informative post.